1 pound sliced, smoked bacon. Saute the diced onions in the olive oil in a large skillet until translucent, about eight to ten minutes. Add the mushroom and garlic and cook until they begin to brown, about three to five minutes. Stir in the cream, herbs, salt and pepper. Bring the mixture to a boil, then reduce the heat and cook until tender, another five minutes or so. Transfer the vegetables to a large bowl and let cool. Preheat the oven to 400 degrees. Add the meat to the vegetables and mix well. Then stir in the egg and mix thoroughly. 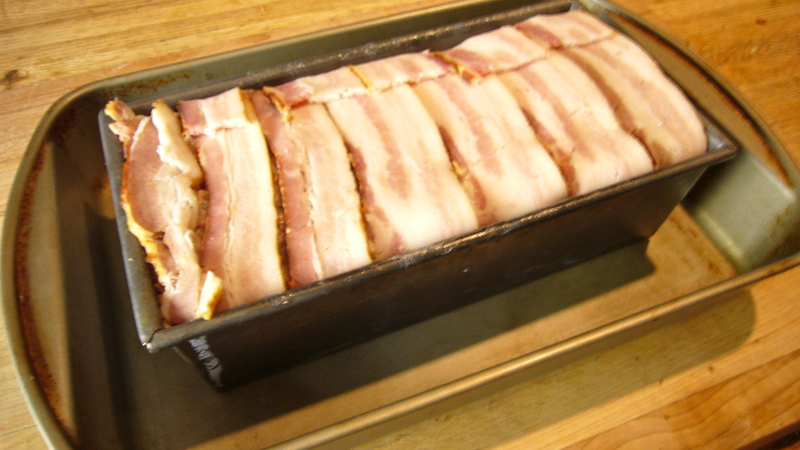 Line by nine by three inch loaf pan with bacon slices, leaving enough bacon overhanging one side to cover the top. (I use a nine by four and it works fine). Add the meat mixture, pushing the meat into the corners and smoothing the top. Cover with the overhanging bacon. 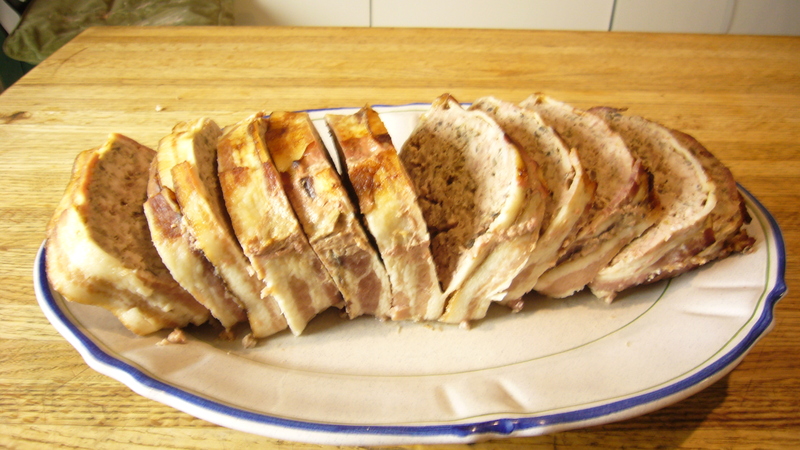 [NOTE: You can make this meat loaf without bacon, but you lose the rich, smokey flavor. And remember, you are using very lean meats). It’s best to bake the meat loaf in a water bath. Put a larger pan in the oven with the meat loaf in the center. Pour in boiling water to about half way up the meat loaf pan, and cover the whole thing with aluminum foil. Bake for one hour. Remove the foil and continue baking until done, about thirty minutes. Test with a meat thermometer. The center of the meat loaf should be 165 degrees. Let the meat loaf rest about ten minutes and then carefully remove from the pan. The juices make a nice gravy. Slice as desired and serve.